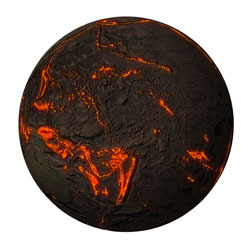 Newly published research shows that the growth rate of the Earth’s continental crust has decreased significantly over the last three billion years, leaving researchers to believe that an early form of plate tectonics began around three billion years ago. The growth rate of the Earth’s continental crust was high during the first 1.5 billion years of the planet’s history then decreased markedly for the next three billion years to the present day, according to Dr Craig Storey, of the University of Portsmouth, and colleagues whose research is published in the journal Science. The researchers say the Earth regulates the net amount of new crust produced by destroying and recycling existing crust. This was achieved as tectonic plates moved and collided against each other and one plate was forced below the other and deep into the Earth. This process is known as subduction, which also generates new crust in the form of large volumes of magma above the subduction zone and results in chains of volcanoes such as in the present day Andes. This process also destroys existing crust by eroding and transporting older crust back down to within the Earth’s mantle. Dr Storey, of the School of Earth and Environmental Sciences, worked with academics from the University of Bristol and St Andrew’s University to produce the collaborative paper. Their research shows the sharp decrease in the growth of the continental crust indicates a dramatic change in the way it was generated and preserved. The conclusions drawn by the researchers are that up to three billion years ago the Earth formed new crust in a different way to today, with larger net volumes of new crust created. The researchers modeled the crustal production rates using a mineral called zircon in sedimentary samples from across the globe to give them a glimpse of the historical behaviour of magma. The variations were used to calculate the balance between the generation of new crust and the reworking of old crust with time throughout Earth’s history. The results suggest that around 65 per cent of the present-day volume of the continental crust was already established by three billion years ago, which suggests that about three cubic kilometers of crust was added to the continental mass each year during the first 1.5 billion years of Earth’s history. This high growth rate then fell sharply during the next three billion years up to the present day ago with just 0.8 cubic kilometers of new crust added each year. Be the first to comment on "Earth’s Continental Crust Growth Rate has Decreased"